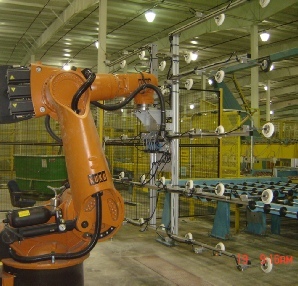 RICHTER ENTERPRISES provides automation for material handling from roller conveyors, feeders and stackers to robotic applications. 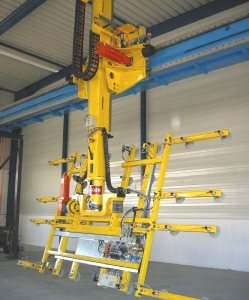 Together with Hager GmbH, the leading manufacturer of gantry type feeders and stackers used on LES and Jumbo size glass we are providing custom solutions for the cold end of float lines, coating lines and glass fabrication. 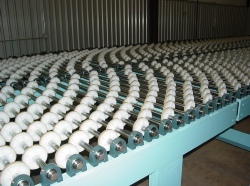 Our engineers work with the customer from specification to the layout and design of the conveyors, the tooling for the robot and the safety cell, and interaction with the operators. 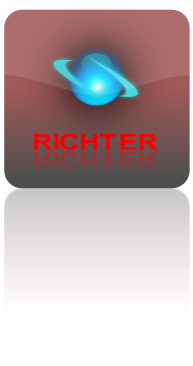 In addition to supplying the conveyors and loaders / unloaders RICHTER ENTERPRISES makes the peripheral machinery like break-out equipment and edge trimming, powder applicators, cutting, washing, inspection, reject removal and cullet crushing or marking.